This post contains a list of the cheapest Glo Call Tariff Plans and migration codes in 2018. Have you ever wondered why your Glo call rates are annoyingly HIGH? Have you been searching for a comprehensive list showing the top and best Glo call tariff plans and migration codes for affordable call rates? Okay then, this post is just what you’ve been missing. Cheap Glo call tariff plans comes in different variations and call rates, NAIJAKNOWHOW’s list of the best Glo tariff plans in Nigeria will cover all the different types of Globacom Nigeria tariff for calling with migration codes attached alongside it. Globacom is one of the leading mobile telecommunications industry in Nigeria and the “Grand Masters of Data”. Glo has made it possible for us to browse the internet at an affordable price, they have the cheapest data plans at the moment. Whilst, being the “Grand Masters Of Data”, Glo has not only sworn to provide cheap internet data, but they made available, unlimited number of Glo call tariff plans with affordable call rates and would excite you. Here’s a table containing the summary of all the various Glo tariff plans and their codes. These plans come with different features and Glo call rates that are arguably the craziest. Here are a few things you might want to expect as you read on. Cheap 11k/s call rates on Glo and more. Choose from Glo’s diverse range of voice/SMS plans, that which suits your personality, budget, style, activities or other preferences. Migrating to any package is easy and seamless by a simple dial. But before you start, you may want to read my post on how to know your active or current Glo tariff plans easily before switching tariff bundles for calling. Check out any of the following Glo Tariff plans below to learn more before picking your preferred Glo call prepaid tariff plan for calling. See how to migrate to some of the best Glo Prepaid Plans and enjoy cheap Glo call rates in Nigeria. glo-bounce-call-tariff-planGlo Bounce tariff plan offers best and competitive flat rate tariff to all networks with unlimited and unparalleled value most especially for our upwardly mobile customers. Call for as low as 15k/s flat-rate to all networks (MTN, Airtel, Ntel, Smile, Etisalat etc) and as low as 11k/s to your friends who are on the Glo Bounce Plan. Free RBT (Ring Back Tunes). Unlimited free SMS: 1 free SMS for 1 charged. 15MB on every ₦200 recharged. Dial *170*4# » select 1 when asked for confirmation.. and start enjoying Glo Bounce. How many minutes will I get with N100 airtime on Glo Bounce call plan? 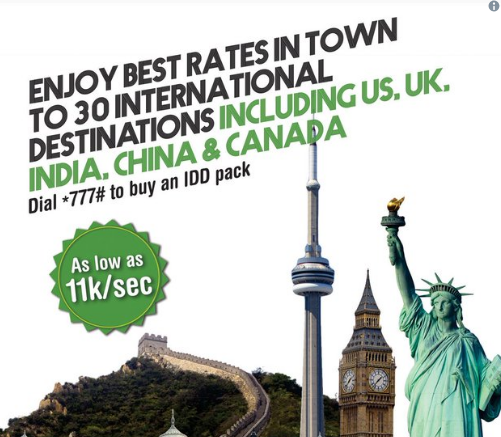 Glo recently announced their new IDD Packs which seems to be the best deal in the country and covers calls made from Nigeria to the same 30 major international destinations for as low as ₦6.60 per minute.